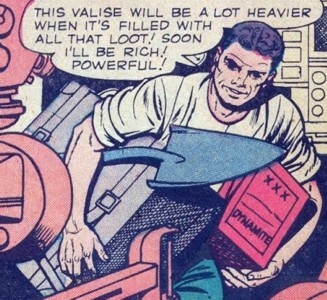 Powers/Abilities: An inventive genius, Hunt built a time machine. Unconcerned with scientific advancement, the unscrupulous Hunt was only motivated by his personal greed and used his time machine to travel to ancient Egypt so he could loot the treasures stored in Tut-Kin-Tut's tomb. 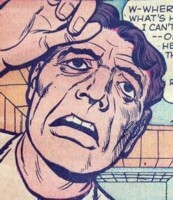 Due to an unforeseen time-paradox, Hunt got into a fist-fight with his future-self, which resulted in his getting a concussion that left him with a case of amnesia. 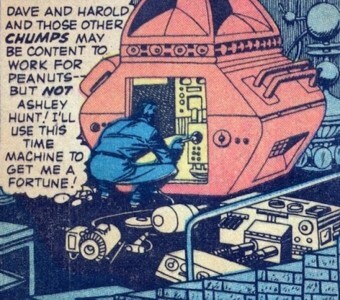 History: (Tales of Suspense I#3/1 (fb) - BTS) - The past of Ashley Hunt is largely unrevealed, but in 1965 AD he was employed as a physicist at a government research laboratory; although his work was important, he was far more absorbed in completing a personal project -- the construction of a time machine. (Tales of Suspense I#3/1) - Hunt turned down an invitation to a social gathering from a co-worker (Dave) because he was eager to get home to his cellar lab to work on his "secret project". Finally, after many months of hard work, Hunt completed his incredible device. After researching through his accumulation of books, charts, and ancient historical reports, Hunt was ready to steal the treasures from the tomb of Tut-Kin-Tut; although his records indicated an earthquake had completely buried the tomb in 2680 BC, Hunt planned to use his invention to go back to 2699 BC, when the tomb was still standing. 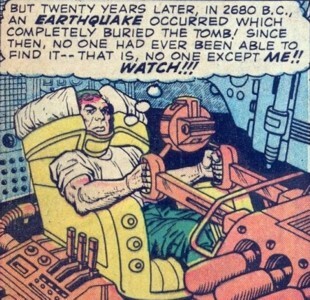 Hunt activated the time machine and was transported back to Egypt in 2699 BC, and he went inside the tomb to search for the treasure of diamonds, rubies, and gold. Suddenly, the temporal tomb-raider was confronted by... his future-self! The two Hunts began to argue over who had claim to the treasure, and punches were thrown; Ashely Hunt fell and struck his head on the tomb's stone floor, knocking himself unconscious -- at that point, his future-self faded from existence (Remember to read the sub-profile for Ashley Hunt's future-self, and hopefully this will make sense). Hours later, Ashley Hunt awoke in an amnesiac state. Unable to recall what had occurred, or even to remember his own identity, he walked out of the tomb and into the desert. 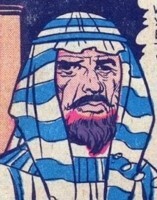 Wandering in a daze, he spotted a desert caravan and thought perhaps the people would help him. (Tales of Suspense I#3/1 - BTS) - Although unable to recall anything of his past, the amnesiac man who had been Ashley Hunt had apparently been taken in by the nomads and given a new life (and presumably a new name) and made his home in ancient Egypt. By 2680 BC, an earthquake buried Tut-Kin-Tut's tomb, along with Hunt's time machine. 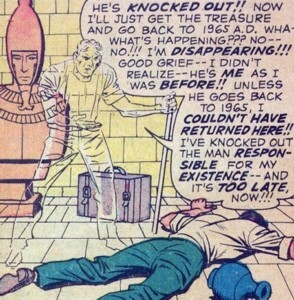 (Tales of Suspense I#3/1) - Thirty-five years later, the bearded old man who had been Ashley Hunt had fallen and struck his head -- as a result, his memory was partially restored, and he had a dream recalling his past life and the events that had transpired in Tut-Kin-Tut's tomb. Fearing he was going mad, he knew the tomb (along with Ashley Hunt's time machine and equipment) had been buried in a great earthquake fifteen years earlier, so he would never know if the dream was true. Although this story was first published in 1959, for some inexplicable reason it was set in the "future" year 1965. I'm no expert on time-travel, so I'll just leave it up to the professionals to sort out all the alternate time-lines and divergent realities that would result from Hunt's Egyptian excursion. Built by Hunt in his cellar lab, it was capable of transporting an individual through time and space. It initially transported Hunt from his American home in 1965 AD to Egypt in 2699 BC, so that he might loot the tomb of Tut-Kin-Tut. Hunt would next use it to return to his home to pick up supplies, then returned a second time to ancient Egypt; but on this occasion, the time machine failed to perform with perfect accuracy, for it had returned Hunt to an hour before he had left, and thus created a divergent time-line in which Hunt encountered his past-self. 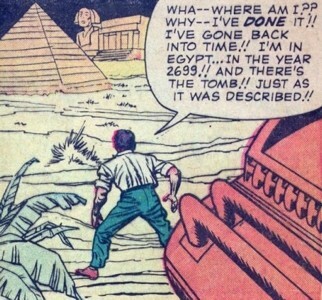 When an earthquake buried the tomb of Tut-Kin-Tut in 2680 BC, presumably the time machine was buried with it. Following his time-traveling to 2699 BC, Ashley Hunt went into the tomb of Tut-Kin-Tut seeking treasure. After a fruitless search of the tomb, he figured the treasures might be hidden in a sarcophagus, so he attempted to lift the lid, but he found it too heavy to budge. He then used his time machine to return to his home in 1965 AD to get some supplies -- a shovel, a box of dynamite, and a valise (to carry the treasures) -- then used the time machine to return to ancient Egypt; however, on this occasion, the machine did not perform with perfect accuracy, for it returned the time-bandit to an hour before he had left (relatively speaking). 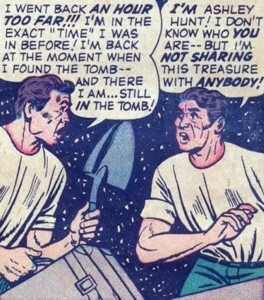 As Hunt walked through the tomb, he was shocked when he ran into himself! 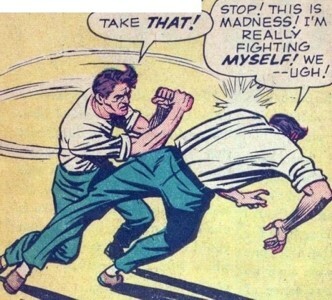 As he argued with his past-self over ownership of the treasure, the two got in a fist-fight, and he ended up knocking his past-self unconscious. 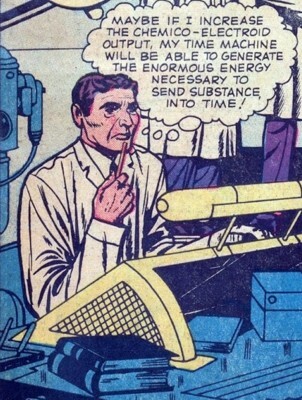 As he faded from existence, Hunt's future-self realized he had inadvertently caused a time-paradox, and as a result of this glitch in the time-continuum, he became a victim of the merciless logic of time-travel: Because he had knocked his past-self unconscious, his past-self would never go back to 1965 and return to become him! 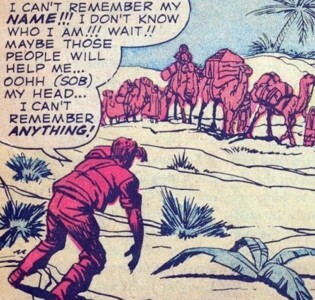 An unspecified number of Bedouins, their caravan was crossing the desert sands of ancient Egypt (circa 2699 BC) when the amnesiac time-traveler Ashley Hunt emerged from the tomb of Tut-Kin-Tut; the nomads took him in and helped him establish a new life in the past.